Hi! I’d love for you to follow me on Pinterest Her Tool Belt and if you love instagram, you can keep up with me there too! Years ago I saw picnic table/benches like these at my Brother in Law’s family cabin. I thought they were the coolest thing and perfect for family gatherings. 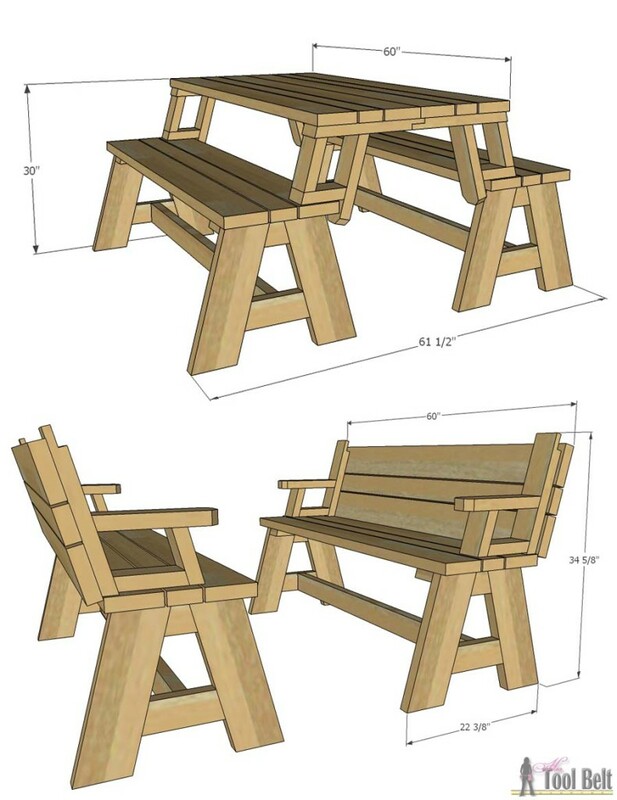 During eating times, you can slide 2 benches together to make picnic tables. When you want to sit around and chat, flip the top over and you have two cute comfortable benches. I decided to make a set for my backyard and I’m excited to use them this summer. One picnic table/bench set cost me about $80 to make, so very affordable. You’ll need a compound miter saw, drill and Kreg pocket hole jig K5 (a R3 will work too) to build it. Check out how simple it is to use. I was a little concerned that on uneven terrain, like grass, the table tops might not line up perfectly. To solve this problem, I included tabs that fit together and hold the table tops even with one another. The tab are definitely an optional feature and can be cut flush, if you don’t want them. 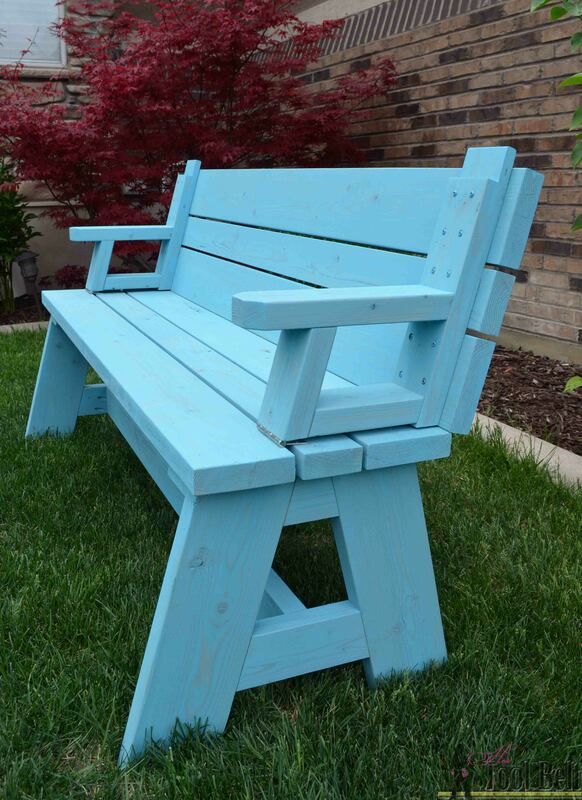 I stained my picnic table with Varathane Vintage Aqua wood stain, to add some much needed color to my backyard. You’ll want to protect the wood with an outdoor protector, like outdoor polyurethane or an exterior paint. I’ve teamed up again with Buildsomething.com to bring you the plans. Buildsomething is Kreg’s new DIY project plan site with hundreds of free plans. BuildSomething is a great community resource for woodworkers and DIY’ers, that may not have a site of their own, to share the plans they’ve created online. Shared plans don’t have to be computer generated, even hand sketches will work. This post was sponsored by Buildsomething.com, all opinions and ideas are 100% my own. Amy this is the coolest thing EVER!! You seriously rocked it, and I love the color! This is so unique! I would have never thought to do this. Keep up the good work! Amazing convertible picnic table. I love the color too! I have designed and built projects like this one. This is a great design. I want to make my next one like yours. Thanks for sharing. Cute picnic table, but it would be very difficult to get in or out of if four people were seated. Thanks. It will easily fit 4 people. Hello, how or where can I obtain the plans? This table is amazing! Great idea. Have you thought of a kid’s sized version? That’s a great idea, I’ll have to get on that. Is there any place, where I can buy it? I live in Mc Kinney tx. I’m not sure where you can by the wood version. Would love plans for the convertible picnic table / benches. size of the stock. 2 X 6, 2 X 8 or 2 X 10, etc. Do you have to make both side or can you use them individually? I haven’t done it, but I think you can use them individually. I’m not sure how much the top can hold individually if people aren’t sitting on the bench. I’m sorry if it was mentioned and I somehow missed it, but did you use pressure treated or just standard lumber? Thank you so much for sharing these plans! I built this as a birthday present for my parents-in-law. They live on a small lake in a small cottage, but they like to entertain. These benches were perfect! We will enjoy these for many years to come, thanks so much again!